The projects form part of the UAE’s support for economic and social development of Pacific island nations, while also showcasing the viability of sustainable clean energy development models. The projects aim to reduce the Pacific island nations’ dependency on imported diesel, freeing up essential financial resources for other developmental projects. The supply of electric power in Tarawa is provided by the Public Utilities Board (PUB), via two generating stations on the island, with an installed capacity of 5.4MW. The solar hybrid project consists in the installation of 500 kWp of photovoltaic production in a low capacity grid, and the automation of the main power plant of the island to allow interactions with the advanced hybrid controls. 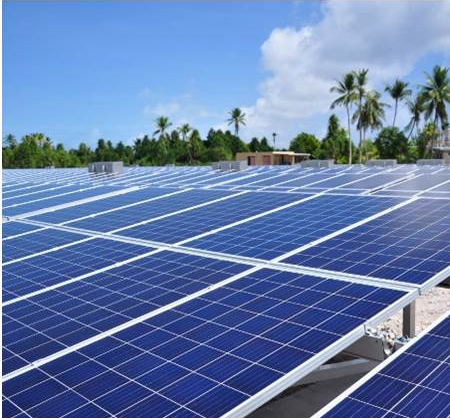 The Tarawa Solar plant supplies 855 MWh of energy on Tarawa, saving 227,000 litres of diesel per year. The project introduces a diversity of sustainable energy sources and also facilitates the country’s growth. A tailored approach during construction was implemented to address the high environmental and logistical constraints of the isolated site. The plant utilises Hybrid Wizard™, the real-time controller developed by Vergnet, to ensure a smooth integration of photovoltaic power on the electrical grid. The solar plant actively participates in the grid stability by automatically adjusting the active and reactive power injection. Hybrid Wizard™ ensures that single outage contingency (n-1) operational criterion is always respected, ensuring grid stability in case of solar or diesel genset loss of power. The PV generation injected in the network currently represents an average renewable penetration of 10%, and the system is ready to seamlessly integrate additional PV capacity planned on the island. The hybrid regulation acts here as a necessary backup regulation lowering energy costs. Sustainable energy is a prerequisite for developmental and economic growth for any society. The renewable energy to be delivered through the solar and water protection plant in Tarawa helps the country overcome not only the constraints of natural fuel resources, but also eases access to large numbers of individuals and families to sustainable electricity provision.